If you're a millennial (born between the ages of 1977 and 1998) you're most likely totally "over" doing what's traditional. Your self-inventive, individualist, "rewrite the rules" personality might have you feeling like you'd like to run from this whole friendship obligation. So it's no surprise that many of you have decided to rewrite the rules of wedding etiquette, while being practical and more comfortable at the same time. You're decided that you and your attendants will wear a suit. Suits are tailor-made for your body. Rented tuxedos are made to be "passable" for as many sizes as possible since multiple bodies are going to be wearing them. There could also be mistakes on shirt and shoes sizes if you rent them. It's not realistic to think that all the guys in your wedding party wear "off the rack" sizes. What if your wedding party consists of big or tall guys? Suits come in size classifications including short, regular, long, extra long, and portly sizes to a size 66. Find a men's clothing store that carries men's big or tall sizes. Big or tall guys will definitely be more comfortable in something that fits them properly. 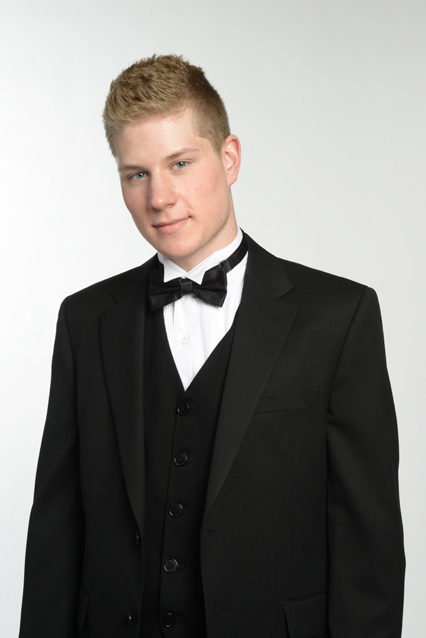 Tuxedo rentals can range anywhere from $50 to $150, not counting the shirt, tie, and shoe rental cost. You can get a nice suit for $325 and wear your own shoes. Pair it with a new mens dress shirt and tie that you can wear over and over again and the whole thing just makes more sense. If you don't already have one, you're probably going to need to wear a suit again sometime. Why put yourself through a emergency buying experience at a time when that's the last thing you want to do? Now you'll have one in your closet for whenever you need it. There's nothing worse than sweating your tail (or tails if you're wearing a tuxedo) on a dance floor wearing something that feels like it should be on someone else's body. (yuck, right?) And because your suit will most likely be of a better quality and fabrication, you'll not only feel better, you'll look better too. And, you don't have to worry about your groomsmen doing it either. You've worked hard to make this wedding happen. Take the job of returning a tuxedo, shirts, shoes and a tie off your list. You now have men's dress clothing that is yours to keep. The best color and fabric choice is something basic such as black, navy or gray either in a solid, pinstripe or pattern in a year round wool fabric. Your shirts, ties, and pocket scarves can then be coordinated with your wedding colors. To find out more about sizes for big or tall men, click here. If you'd like to know more about putting together looks for yourself and your groomsmen, you can find some good tips in our Free Business Casual Tips guide below.